As safari 2009 is in full organisational swing here’s an update of who’s in the Hall of Fame. Hall of Fame inductees are those who go above and beyond in a safari sense but they are also the organising committee of the annual safari pub crawl event. It all started in 2001 when John was the inaugural inductee into the Hall of Fame. In 2002 it was Sal and Maz. And as that’s all I ever got around to putting on this website, it’s now time to catch up from the last six years. We welcomed Trev in 2003. I think it was the combover wig that did it. That’s definitely going above and beyond the safari call of duty. It was Cath’s turn in 2004. Underneath that hideous lovely macrame owl she’s eight months pregnant. That’s gotta deserve a gong. Toni otherwise known as TP has always been wearing 70s stuff and accessorising it beautifully ever since I knew her so she had to be a shoe-in. Jen, aka the person doing this website, won in 2006 pretty much for doing the website. Talk about going above and beyond the call of duty. Now I get to do the website and help organise the annual pub crawl too. Mmmm. 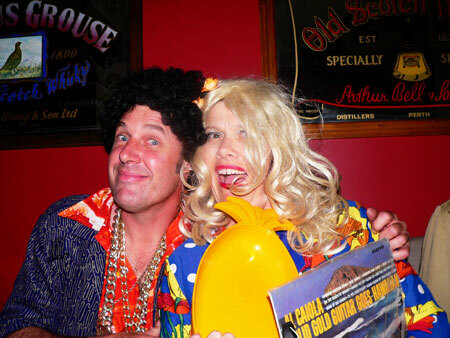 In 2007 there was no safari pub crawl as Gus was away and the rest of the committee took a break that year. In 2008 Kazz (aka Polly Waffle) was inducted into the Hall of Fame. Now when you see us at safari 2009 say hi (if you don’t know us already) and feel free to buy us a drink, cause we deserve it. 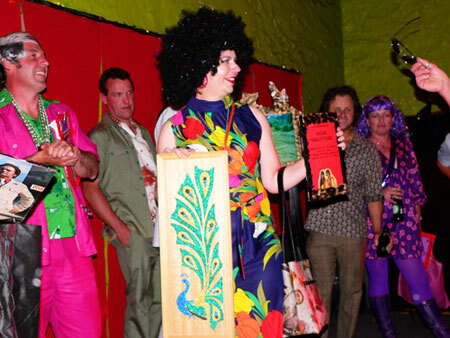 I was inducted into the Hall Of Fame in a blur of bright lights and cheesy amplified disco. It had been a long time coming, and the preceding years deserve a story of their own (my management team are currently negotiating with Bryce Courtney). Suffice to say I had endured a lot of synthetics directly on my sensitive skin, and suffered days of post-safari eczema. On route to Safari, I grew accustomed to the candid ridicule of gilt-edge fashion obsessed youth on public transport (while the two founding-fathers, Winks and Gus, rolled up in limousines, sipping chardonnay, eating jatz and devilled ham-paste). Anyway, it was the year of 2001. My year. We had gathered at the Charles Sturt Tavern for the final awards ceremony. 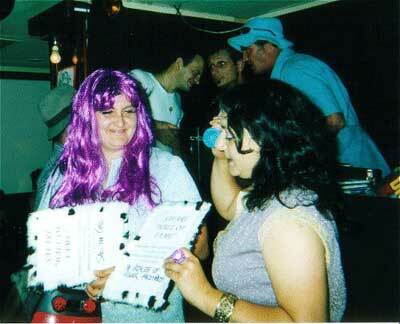 There was a miscellaneous wig award that has since morphed into a permanent fixture…missed it. The big one, the Don Dunstan Young Achiever…missed it (picked up by some trumped up wannabe with a fake handkerchief and barely enough bum-crack to drop a five cent piece into). But then something new…Winks and Gus had decided, for reasons of their own, to open a Hall Of Fame, and I was announced the first inductee. Thinking about it still gives me goose pimples. I tearfully took the microphone, and with a voice broken by sobbing, thanked my mother, and began a lengthy dedication to my late father (who, as a public servant, actually wore a safari suit before they went out…and then back into fashion). Winks grabbed the microphone back from me mid-sentence, and quipped a joke at my expense about how Mariah Carey had given shorter acceptance speeches. We haven’t spoken since, except where absolutely necessary for Safari administration. We exchanged brief pleasantries at the christening of his first-born, to whom I was made God-Father, perhaps as a conciliatory gesture, I’m not sure…but the damage had already been done. Anyway, that’s all troubled waters under the bridge now. A week after that Safari, I was sent a typed letter on a Safari letter-head informing me of my newly won duties and responsibilities. The list was long, the duties onerous. As safari 2002 drew near, another letter was sent listing the ever-expanding list of award categories, instructions on which prizes to procure, and maps of the iron-triangle towns where I might be lucky enough to find them. On the big night, my newly won duties involved carting half a ton of prizes in my barely adequate shopping trolley, from venue to venue, while Winks and Gus ponced and swanned about, deciding which category should be awarded where. Once informed, I would have to fish the correct prize out of the trolley. Each award is actually a group of prizes (records, cook-books, wall hangings etc. ), and each group for each category was contained in a plastic shopping bag, which were mostly split and disintegrating from being used for the same purpose since 1989. Finding a specific award bag involved placing all the other award bags on the footpath (I wasn’t allowed in the pub while on duty). More often than not, after isolating the correct bag, and placing all of the others back into the trolley, I would walk into the pub to give the nominated bag to Gus (desperately seeking his approval), only to find that they had changed their mind, and that they would award that particular category at the next pub…maybe. At the end of the night, after 15 minutes of trying to get a taxi, I finally hailed one down on Hindley Street. I opened the door, Winks and Gus jumped in, shut the door, and sped off into the night. I walked down Anzac Highway and eventually home to South Brighton, trailing my shopping trolley behind me. I was egged on the way outside K-Mart, and then again at Glenelg (I didn’t feel so bad the second time though because I think it was the same group of lads as the first time, out for a bit of a lark). Since that year, more individuals have been inducted into the Hall Of Fame. Accordingly, although still at the beck and call of the founding fathers, I have progressed upward through the hierarchy (only by having others slotted below me). Now my duties are mainly diplomatic. Gus recently commented that he likened me to Julie, the Activities Officer from the Love-Boat. I chose to take it as a compliment, it carried certain implications during the Popeye cruise. Things are a bit easier now, and I’m enjoying the trickling down of bossiness and disrespect to the new minions. There was no separating these two Safari Hall of Fame inductees. Congratulations Sal and Maz.